These materials assess changing trends in the economy and the environment, and how they impact on the future. When many of us think of Taipei, the area that encircles the Taipei city is not what would usually come into mind. Though more and more, it is seemingly obvious that one should pay attention to the land space that is home to over 3,8 million people. This location is none other than the Taipei County. The county controls ten county-controlled cities(縣轄市), nineteen townships (鎮) and a thousand over villages (里) which include some of the key tourism areas such as Tamshui, Wulai and Fulong. In the time of the Dutch colonisation, the principal inhabitants were the people of Basay, the Attayals emerged in the south of Taipei County soon after. Han Chinese eventually immigrated to the region in the mid 17th century, and aboriginals were consequently compelled to assimilate or immigrate to the mountainous regions. In the 50s’ Taipei County saw more and more reforms concerning the arrangement of cities, townships and villages into counties and eventually became the Taipei County that we have today. With the vision of a Greater Taipei in mind, the current Taipei County government wishes to include all townships and villages into the limits of Taipei City and become known as a whole administrative region. When I was a child, I was called Wusay. My father probably preferred the "-ay" ending - he named my elder brother Foday. So we were, originally, Foday and Wusay. Some twenty years later, one day, I came back to Tafalong to visit my Grandfather. We had a nice chat before he started to call me Nakao. "Why do you call me Nakao?!" I was astonished. "Your name is Nakao," said Grandpa peacefully. Later on, I went to Sado and asked my aunt, "my name is Wusay, right?" "Yes...." My aunt nodded, slightly confused. "But Grandpa says, just now, that my name is Nakao." "Oh really?" My aunt thought for a second and said, "in that case... you are Nakao." My transformation took about ten minutes only. One day, my neighbor, a Hoanya, asked me why I had my father’s name after my own, rather than my mother’s. "Pangcah is a maternal society. Shouldn’t you take your mother’s name so that people can tell from which family you are?" "Because my mother was Han," I replied. "Just that she married to a Pangcah who has a Japanese name." "But her birth place is in Kalingko, not too far away from my father’s," I added. "She was born at the foot of Mei-lun, a nice hill. Her mother used to call her Mei-lun; sometimes my father called her Melon." The Hoanya then suggested me to replace my father’s Japanese name with Mei-lun. "I think Melon is better," I said. "Nakao Melon is a rare kind of melon, a Tafalong specialty." "That’s it!" The Hoanya exclaimed. "I want to order a trunk of Nakao Melon!" My second transformation took even less than five minutes. There is no pinganganan (something after which one is named) for my name. My name has always been a nisanga’an (something that is created). The Taipei County Government’s seat is located in Banchiao, nearby Taipei City, in a big complex that oversees a giant piazza. There, on Saturday October 4th, the auditorium was filled to full capacity with members of grassroots organizations, friends of this year’s Life Sustainability Awards winners, readers of Renlai monthly, officials, entrepreneurs and graduate students.. The topic that was gathering them together: “Taiwan Culture vs. Global Warming” - an international forum organized by Renlai, Ricci Institute and the Taipei County government, in association with Wen-hsiang Foundation, the French Institute in Taipei, ROC’s Foreign Ministry and other organizations. A day of intense exchanges and debates, which had been preceded on Friday by meetings with President Ma, Governor Chou, the ministers of culture and foreign affairs, and also a formation session for the officials of the county. On Sunday 5th, the guest form afar were invited by Taipei County to cruise the Tamshui river and visit its ecological and cultural resources, as well as to reflect together on the overall strategy pursued by the county for reducing carbon emissions. A basic fact was gathering together all participants: global warming is partly a made-man phenomenon, an acknowledgment that has caused a lasting shift in the concerns of the international community. And climate is one of the “public goods” that can be sustained only through good world governance. Nations and international organizations are still struggling for defining the methods, the institutional framework and even sometimes the set of values that need to ground an international system primarily focused on issues such as climate change. A task of such amplitude cannot and should not be undertaken by State organizations or specialized agencies only. The awareness and creativity of civil societies are a prerequisite for making nations and people join their efforts. Cross-cultural encounters provides all of us with new approaches, new ideas, new viewpoints that facilitate consensus-building and accrued inventiveness. Identifying and re-interpreting a set of cross-cultural resources so as to better tackle common challenges - such endeavor has been the core inspiration and concern of this colloquium. We were together testifying to the cultural, technical and economic assets that Taiwan is able to bring forth so as to take its place into this global struggle – testifying also that this can be done only in coordination with other countries, especially with Europe. Dominique Baudis, president of the Institute for the Arab World, said at the opening of the forum: “The challenge of climate change is an opportunity for the international community - as long as it obliges us to reflect on the roots of our behavior, to consider anew our values and priorities, and finally to invent together a model of humane and sustainable development, creating new solidarity among nations, regions and cultures of the globe. 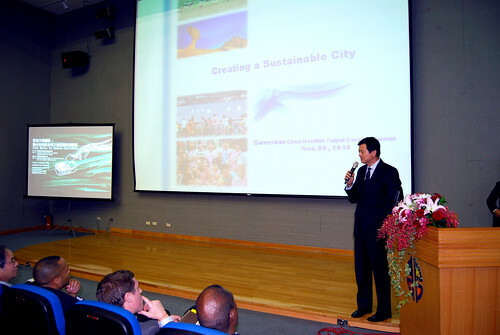 The issues that we are tackling today, therefore, go beyond the groups, traditions and interests that we represent.” The contributions of Vice Governor Lee and François Bordry (former chairman of French Waterways) were a concrete expression of this conviction, as it showed us how Taiwan and Europe have been reassessing the management of their water resources over the past two decades so as to nurture their ecological, economic and touristic potential – and how these lessons can be furthered and deepened through mutual exchanges. The afternoon forum on Taiwan and China has illuminated the positive role that Taiwan can play in this area, at a time when Europe and other countries are trying to make China commit itself to clear and compulsory objectives of emissions reduction. And a lively debate held among intellectuals, entrepreneurs and political leaders has shown to us that the self-awareness displayed by Taiwanese citizens does not turn them inwards: the sense of self-awareness and self-examination, so vivid in Taiwan, is by itself an important asset for helping other people and nations to explore their modes of behavior and go beyond the frontiers of doubt and feeling of hopelessness. The final intervention by Professor Sun Ta-chuan on the way Aboriginal culture can help Taiwan to redefine its modes of production and consumption was most inspiring in that respect: it was infused with an optimism that was in no way contrary to a realistic evaluation of the challenges that await us. The winners of this year’s “Life Sustainability Awards” are further proof that Taiwan knows how to make optimism, realism and inventiveness one and the same virtue, a virtue grounded in its historical experience and the diversity of its resources. The eRenlai’s November Forum will illustrate through excerpts of the speeches, interviews and animations all that can be learnt form these three days of interaction. We hope this will be a lasting source of inspiration in Asia and other continents alike.